With Easter around the corner, I was looking for an easy and fun way to teach little ones about Easter. 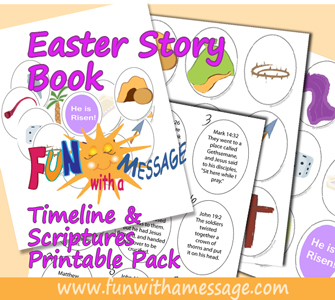 There are some excellent resources out there but I wanted something more pictorial that would teach the true reason and meaning behind the Easter holiday. Images are the best way to help memorize a story and perfect for kids to understand a story’s timeline. 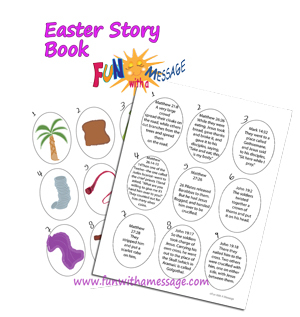 The Easter Story Printable Book can be used to help children remember the events of Easter using the main symbols of the Story. Older kids can read the scriptures and match to the symbols. Includes 18 pictures and corresponding Scriptures plus book covers. Read the Scripture, and let the kids find the corresponding symbol. Cut a hole at the top of each shape and have the kids tie them up with a yarn. Hope you and your kiddos enjoy it! See below how to download the free printable. 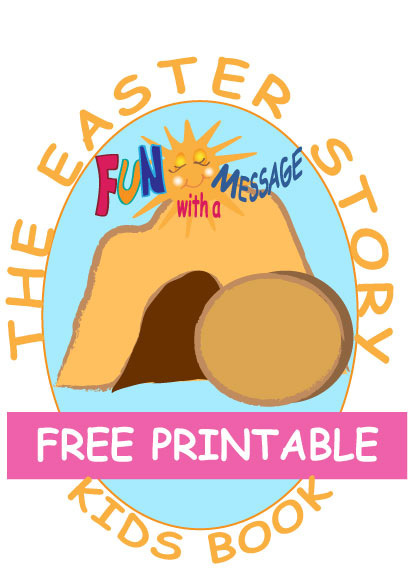 Don’t miss out on this FREE printable that will help you teach your kids the true meaning of Easter. 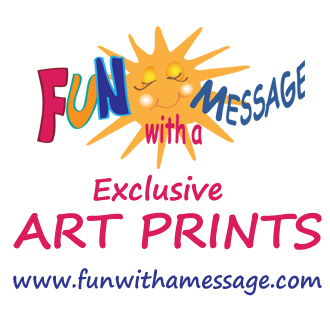 After you confirm your subscription, the Fun With A Message file link will be delivered via email. Please make sure to add Fun With A Message to your email contacts. If you don’t see it in your inbox, check the spam and junk folder. 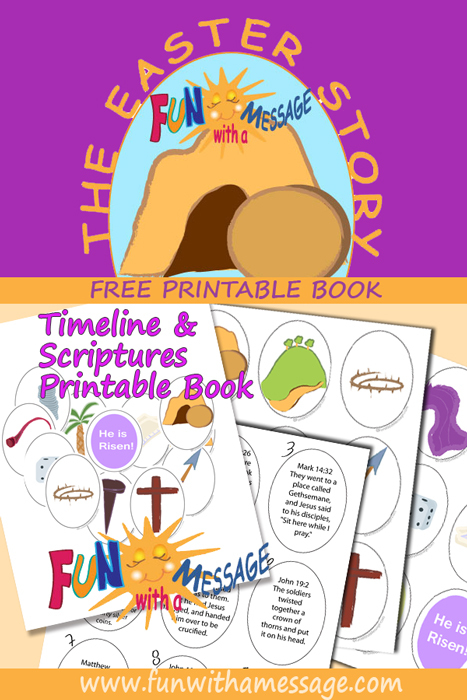 Thanks for making this wonderful resource available I plan to use it for our children church for Easter and the weeks leading up to it. I was excited to see it on Jamerills, FreeHomeschoolDeals.com. Hi. I subscribed to receive the freebie, but I did not find this Easter freebie on the subscriber freebie page. There was a Christmas one instead. Is there a new password, or am I just missing the link? Help! I apologize – Please try downloading again. The issue has been fixed! What a creative idea! I appreciate the other resources you included, as well. May God continue to bless your ministry! Thanks for linking up at Grace & Truth. This is becoming one of my go-to places for good resources! Thank you for sharing at Motivate and Rejuvenate! This looks pretty cool! 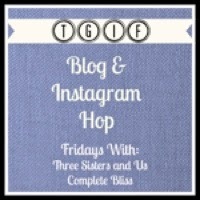 I’d try to print this out for my daughter Thanks for linking up to the Bloggers Brags Pinterest Party. I have pinned your post to the Bloggers Brags Pinterest Board. Hi! Thank you so much for linking up with Tuesday Talk. I’ll be pinning this on Pinterest for sure. And I’ll be printing it off today. Thank you so much! How do you get the freebie if you are already subscribed. It just told me I am already subscribed. What an awesome set of printables.